Structures such as buildings, bridges, industrial structures, equipment, machinery or other subsystems such as piping are often subjected to severe vibration motions due to earthquakes, heavy wind or machinery. It is necessary to reduce the vibrations that are experienced by the structures for safety, serviceability, or for operation considerations. One strategy for enhancing safety of such structures is to use vibration isolators. The second type is a variable period protective pendulum isolator for structures having fundamental time periods from 0.2 s to 6.0 seconds, which dissipates energy through friction at sliding surface and transmits reduced energy into the structure. 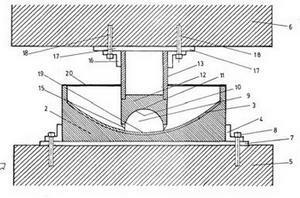 The variable period vibration protective pendulum isolator has its time periods varying in a pre-determined way as the sliding takes place, which limits the restoring force so that the force transmitted to the structure is bounded irrespective of magnitude of sliding displacement of the isolator or the size of the earthquake. The growing need to counter strong vibrations of large structures as a protective measure makes these technologies useful and important. Such applications are typically observed in important life-safety buildings such as hospitals and communications facilities, and in facilities such as bridges and pipelines. The application of these protective measures also exists for safety of important objects such as displays in museums.